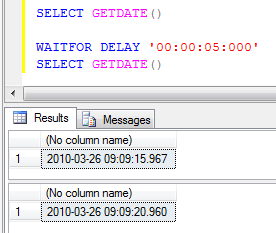 When writing T-SQL Statements, the usage of WAITFOR clause will cause a delay in the execution of the subsequent statements until the condition is met. WAITFOR clause can be used along with Time or Delay. Let us look at them with an example. 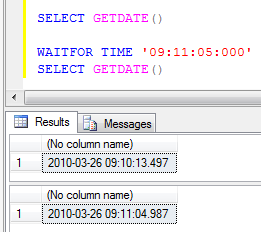 This entry was posted in SQL Server and tagged T-SQL, WAITFOR clause by Brumedishetty. Bookmark the permalink.